That’s when Holmes coach Tony Perkins called a timeout to give his players a chance to regroup and they launched a comeback that resulted in a 45-42 win. The Bulldogs claimed their first regional championship since 2002 with the victory and earned a berth in the St. Elizabeth Healthcare/KHSAA “Sweet 16” state tournament that will be played in Northern Kentucky for the first time. 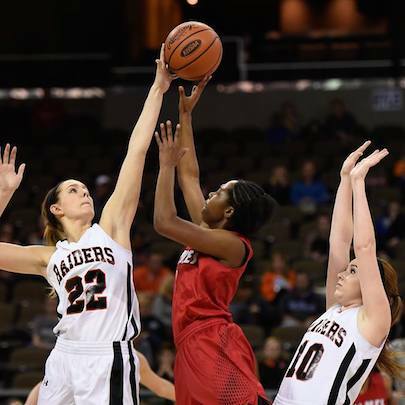 Holmes will take on Russell, the 16th Region champion, in the opening round at 8 p.m. Wednesday at BB&T Arena. Advance tickets are available at the arena for $11. Tickets at the door will be $13. 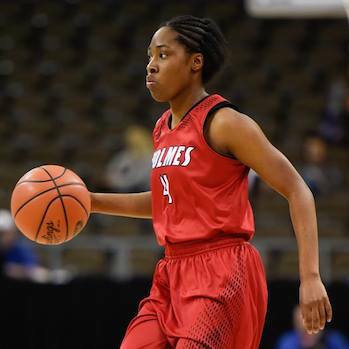 Last year, Holy Cross beat Holmes in the 9th Region final and went on to become the first Northern Kentucky girls’ basketball team to win the state tournament. Harris said the Bulldogs have worked hard to get their shot at a state title this season. Harris made two free throws to put Holmes ahead, 44-42, with 52 seconds left in Sunday’s regional final. That was only the third time the Bulldogs took the lead in the game. After Ryle missed a shot in the lane, Holmes junior forward Tyrah Engelmon made a free throw that extended her team’s lead to 45-42 with 18 seconds left. Ryle called a timeout to set up a final play. The ball went to senior Mallory Schwartz and she launched a 3-point attempt that bounced high off the rim as time expired. Ryle handled the full-court defensive pressure that Holmes usually relies on to get transition baskets. That forced the Bulldogs into playing a half-court game and they had trouble scoring against the Raiders’ zone defense. “We didn’t shoot the ball very well, but our girls battled and didn’t give up and made plays when they had to,” coach Perkins said. Holmes made 16 of 26 free throws to offset shooting just 28.8 percent (13 of 45) from the field. In the final minutes, the Bulldogs scored eight of their last 10 points at the foul line. Ryle was 3-for-9 at the line, but Haitz didn’t criticize the officiating for the discrepancy in fouls called against the two teams. Harris finished with a game-high 14 points for the Bulldogs and was named most valuable player on the all-tournament team. Ryle’s leading scorer was Schwartz with 13 points. Harris is looking forward to finishing her high school career playing in her first state tournament next week. HOLMES (28-4): Brown 3 3 9, Harris 4 5 14, Graham 1 1 4, Stovall 2 6 11, Johnson 2 0 4, Englemon 1 1 3. Totals: 13 16 45. RYLE (24-7): Scherr 3 1 7, Jones 2 0 5, M. Schwartz 6 1 13, L. Schwartz 3 1 7, Jump 1 0 2, Carothers 3 0 6, Lange 1 0 2. Totals: 19 3 42. 3-pointers: H — Harris, Graham, Stovall. R — Jones.